Sixty years of the Volvo Amazon. Here’s what I wrote about it in 1961. Designed by 26 year old Jan Wilsgaard, it came out in September 1956 as Volvo’s second postwar model after the PV444. I was The Glasgow Herald’s Special Correspondent; its real motoring correspondent James Brydone McLaren was kind enough to encourage a writer younger than the Volvo’s designer. It wasn’t called the Amazon when I borrowed G35 (red with a light grey roof looked dashing in 1961) and photographed it at Craig’s house. Known only as a 122 because a Kreidler Amazone moped got the name first, it was Amazon in Nordic markets. My test car was a 122S, which meant Sport. In 1959 the Volvo three-point seat belt became a standard fitting. I am not inviting comments on my writing style of 55 years ago. It was OK for The Herald then. It would be nice to lighten it a bit, but I haven’t. MOTORING TODAY. The Glasgow Herald, Friday December 1 1961 From a SPECIAL CORRESPONDENT IN these days of rapid technical advancement it is unusual to find a car of conventional design capable not merely of holding its own in world markets but even providing fierce competition to its apparently more up-to-date rivals. 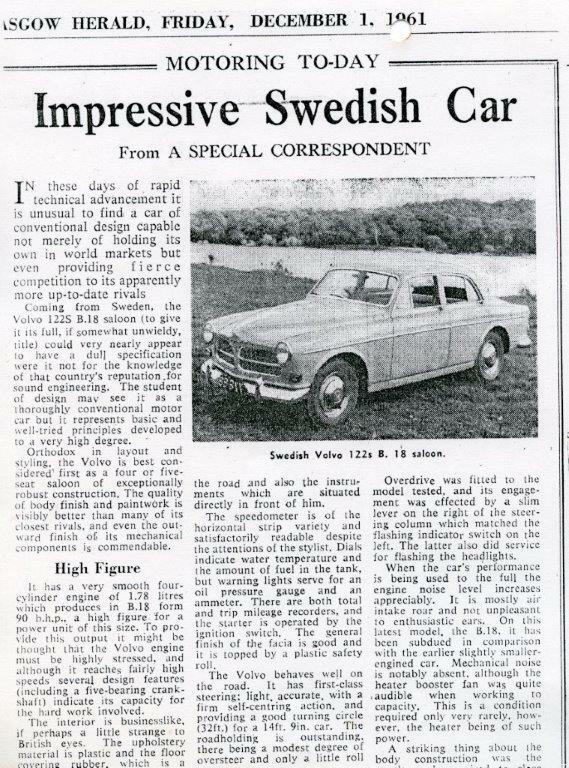 Coming from Sweden, the Volvo 122S B.18 saloon (to give it its full, if somewhat unwieldy, title) could very nearly appear to have a dull specification were it not for the knowledge of that country’s reputation for sound engineering. The student of design may see it as a thoroughly conventional motor car but it represents basic and well-tried principles developed to a very high degree. Orthodox in layout and styling, the Volvo is best con­sidered first as a four or five- seat saloon of exceptionally robust construction. The quality of body finish and paintwork is visibly better than many of its closest rivals, and even the out­ward finish of its mechanical components is commendable. It has a very smooth four-cylinder engine of 1.78 litres which produces in B.18 form 90 b.h.p., a high figure for a power unit of this size. To pro­vide this output it might be thought that the Volvo engine must be highly stressed, and although it reaches fairly high speeds several design features (including a five-bearing crank­shaft) indicate its capacity for the hard work involved. The interior is businesslike, if perhaps a little strange to British eyes. The upholstery material is plastic and the floor on covering rubber, which is a thoroughly satisfactory arrangement for the practical Swede but less luxurious than his counter­part in this country might expect of a £1372 car. Carpets are, however, offered for a few pounds extra. Among the comprehensive equipment which is included in the initial cost of the Volvo are safety harness of an unusually good design, screen washers and two-speed wipers, and a very powerful heater and demister unit. Obviously intended for Arctic conditions this instal­lation was found capable of de-icing a thickly coated wind- screen in a matter of moments in conjunction with the radiator blind (another standard item) to help the engine warm up quickly. Driving the Volvo in town it may be handled in a quiet, dignified manner befitting its unostentatious appearance. At low speeds the engine is docile and quiet and the car easily handled. Away from the traffic, how­ever, the Volvo accelerates and handles like a real sports car. This quite large saloon has been developed to provide within the frame of a family sized car all the attributes of a thoroughly sporting machine. The driving seat is fully adjustable for both fore-and-aft movement and backrest rake. Thus drivers, of almost any shape and size may be accom­modated at the big, nearly vertical, steering wheel and given a commanding view of the road and also the instruments, which are situated directly in front of him. The speedometer is of the horizontal strip variety and satisfactorily readable despite the attentions of the stylist. Dials indicate water temperature and the amount of fuel in the tank, but warning lights serve for an oil pressure gauge and an ammeter. There are both total and trip mileage recorders, and the starter is operated by the ignition switch. The general finish of the facia is good and it is topped by a plastic safety roll. The Volvo behaves well on the road. It has first-class steering; light, accurate, with a firm self-centring action, and providing a good turning circle (32ft.) for a 14ft. 9in. car. The roadholding is outstanding, there being a modest degree of oversteer and only a little roll on corners. When pressed to the limit on fast bends the rear wheels break away in a safe, control­lable fashion, although on rough roads the rigidity of the rear axle becomes apparent. The body is quiet even when the suspension is working hard, and the drumming experienced on cobbles does not become objectionable. Disc brakes on the front wheels give fade-free stopping from the Volvo’s maximum speed which is in the order of 95-100 m.p.h. Brake pedal pressure required is, however, fairly high for a car which may be driven by all members of the family, and, likewise, the clutch (which has a short travel) needs quite a firm push. The handbrake is by the driver’s right hand on the floor and is a good, stout, easily gripped lever. The gearchange is the only control which seemed less than satisfactory. There is synchro­mesh on all four gears, but engagement of first with the car at rest could be a very difficult business indeed. Reverse has a heavy spring to prevent unin­tentional engagement and is noisy, but all the other ratios are inaudible. Once on the move the gear-change is less unpleasant, but the lever itself is long and requires.an awkward movement of the arm. The synchromesh is powerful and cannot be beaten, and the gear ratios are very well chosen. Overdrive was fitted to the model tested, and its engage­ment was effected by a slim lever on the right of the steer­ing column which matched the flashing indicator switch on the left. The latter also did service for flashing the headlights. When the car’s performance is being used to the full the engine noise level increases appreciably. It is mostly air intake roar and not unpleasant to enthusiastic ears. On this latest model, the B.18, it has been subdued in comparison with the earlier slightly smaller-engined car. Mechanical noise is notably absent, although the heater booster fan was quite audible when working to capacity. This is a condition required only very rarely, how­ever, the heater being of such power. A striking thing about the body construction was the gentle push required to close the doors. They operate in a manner reminiscent of a quality coachbuilt body. One item sorely missed when driving the Volvo fast is a rev counter. Used as a family car (which is really what it is counted as in Sweden) its absence would not be noticed, but the enthusiast using it and taking advantage of the 5000 r.p.m. available would almost certainly welcome an indication of engine speed. In their efforts to secure the best, Volvo use components manufactured all over Europe. Many are made in Britain and some (including the whole electrical system) in Germany. The result is a car renowned for hard wear and hard work. It is a highly developed, pre­cision-built machine laid out along well-tried, thoroughly proved lines making few con­cessions to fashionable trends merely for their own sake. It is fast and sporting as international rally successes indicate, as well as being roomy, businesslike, and comfortable, and is creating the kind of reputation which maintains its second-hand value at a much higher figure than many other imported cars. The Volvo 122S B.18 was supplied for test by Buchanan of Glasgow, European car specialists, of Woodlands Road, Glasgow.